Tim Vance accomplished what every poker player on Pokerstars dreams of - he took 10,000 FPPs and translated them into a victory at an EPT event. 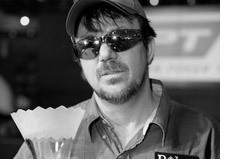 Vance qualified for the EPT Copenhagen event through a 10,000 FPP satellite to the main event on Pokerstars. A short while later, the 46 year old contractor from St. Louis was celebrating his 834k euro win. The road to glory was a tough one to navigate as the EPT Copenhagen event was stocked with talented poker players. The field included such pros as Daniel Negreanu, Bill Chen and Tony G. However, at the end of the day, an amateur American player took down the EPT Copenhagen title. The heads-up battle between Tim Vance and Soren Jensen was the longest heads-up EPT battle in history, clocking in at just around 4 1/2 hours. Both players were playing extremely weak and tight in the heads-up battle, constantly check-folding and checking down to the river. Neither one seemed to have the killer instinct to put pressure on their opponent, as a professional player in that circumstance likely would have. The final hand came when Tim Vance turned the nut flush. Soren bet 115k and Vance called. The river was another spade, and Soren moved all-in, leading Vance to quickly call with the nut flush. Soren Jensen took down 472k euros for his second place finish. Magnus Hansen finished in third place, followed by Rasmus Nielsen, Danny "THE__D__RY" Ryan, Nicolas Dervaux, Simon Dorslund and Patrik Andersson. The EPT Copenhagen event turned out to be extremely popular with players, easily hitting the 460 player cap in the event. The total prize pool was $4.35 million dollars, making it the largest prize pool ever in the history of the event. The tournament benefited from the fact that Pokerstars was constantly holding satellites to the event. Also, the fact that the minimum age to play in the event is 18 makes it an attractive stop for those players who aren't yet old enough to play in Las Vegas. I wouldn't be surprised to see tournament organizers raise the cap yet again next year.